Removal ProcedureRemove the exhaust camshaft position actuator. Refer toCamshaft Position Exhaust Actuator Replacement. 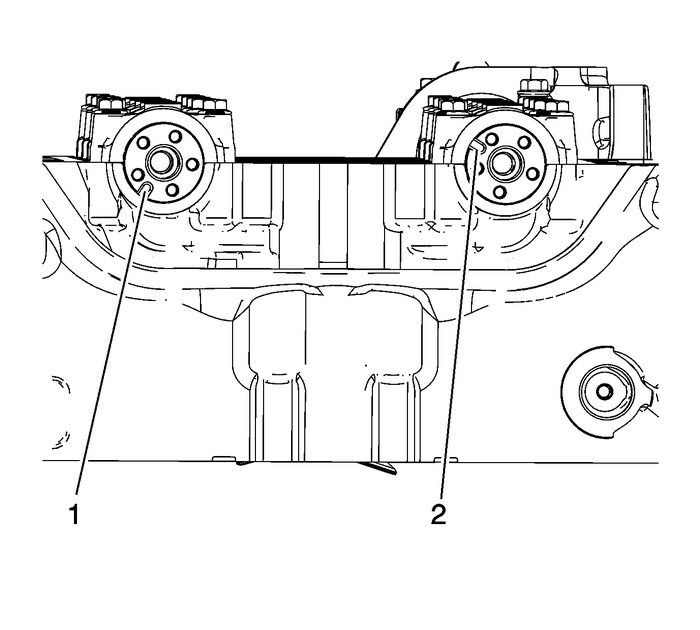 Remove the exhaustcamshaft position actuator solenoid valve bolt-(1) and valve-(2). Note:Remove each bolt on each cap one turnat a time until there is no spring tension pushing on the camshaft. Mark camshaft caps to ensure they are installed in the sameposition.Remove the exhaust camshaft cap bolts.Remove the camshaft caps ensuring they are marked andrefitted in same position on assembly.Remove the exhaust camshaft. Note:Keep all of the roller finger followersand hydraulic lash adjusters in order so that they can be reinstalledin their respective locations. Remove the exhaust camshaft roller finger followers. Install the hydrauliclash adjusters into their bores in the cylinder head and lubricate.Refer toAdhesives, Fluids, Lubricants, and Sealers. Lubricate the valvetips. Refer toAdhesives, Fluids, Lubricants, and Sealers. 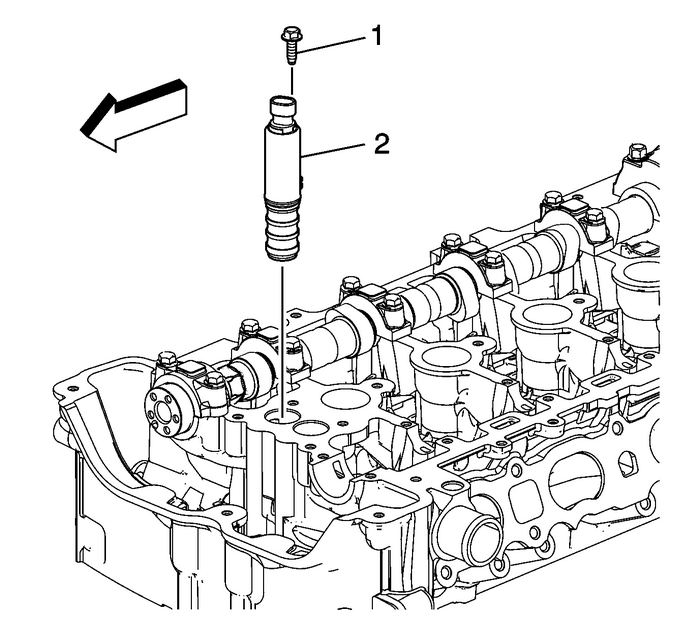 Note:Used roller followers must be returnedto the original position on the camshaft. If the camshaft is beingreplaced, the roller followers actuated by the camshaft must alsobe replaced. Position the roller followers on the tip of the valve stem andon the lash adjuster and lubricate. Refer toAdhesives, Fluids, Lubricants, and Sealers. 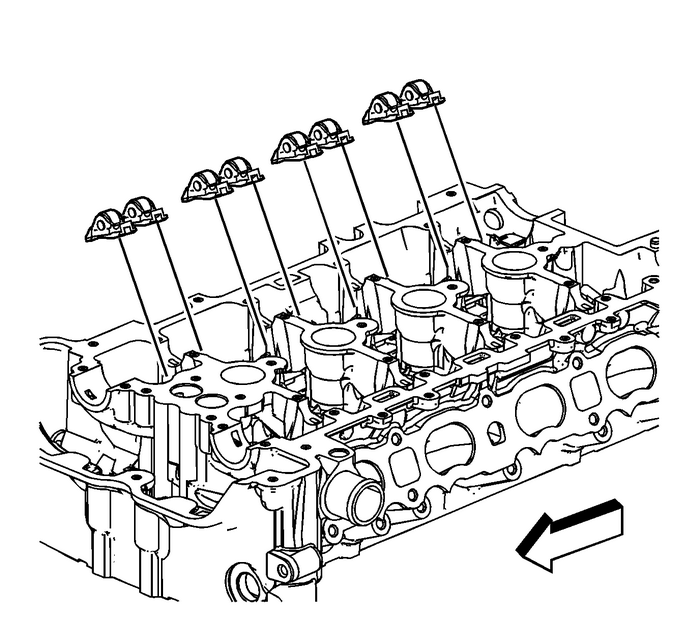 Note:If equipped with the following engine;LE5, LE9, LAT, LNF, LDK, LHU, LTD, LBN, or 2010 LAF, ensure the intakecamshaft notch is in the 5-o'clock position-and the exhaust camshaftnotch is in the 7-o'clock position. 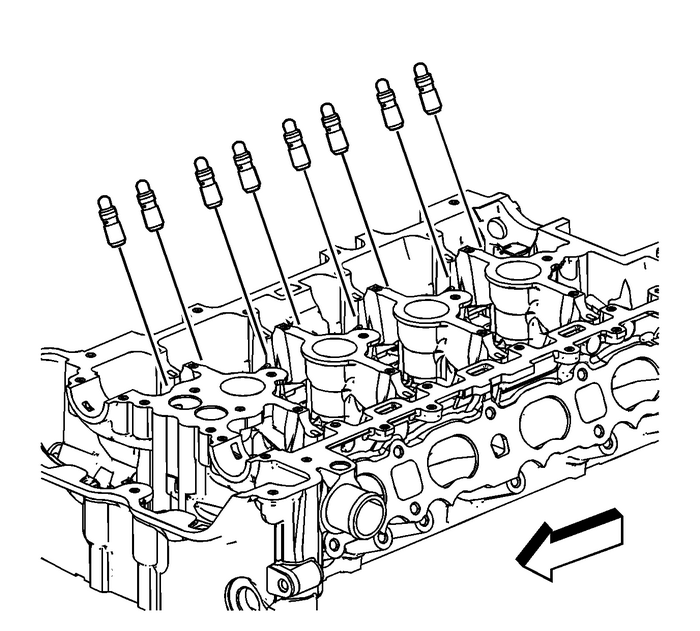 Ensure the intake camshaft notch is in the 5-o'clockposition-(2) and the exhaust camshaft notch is in the 7-o'clockposition-(1). The number-1 piston should be at top deadcenter ( TDC), crankshaft key at 12-o'clock. Note:If equipped with following engine;LAP, LE8, LEA, LUK , or 2011 LAF, ensure the intake camshaft notchis in the 10 o'clock position and the exhaust camshaft notch is inthe 7 o'clock position. 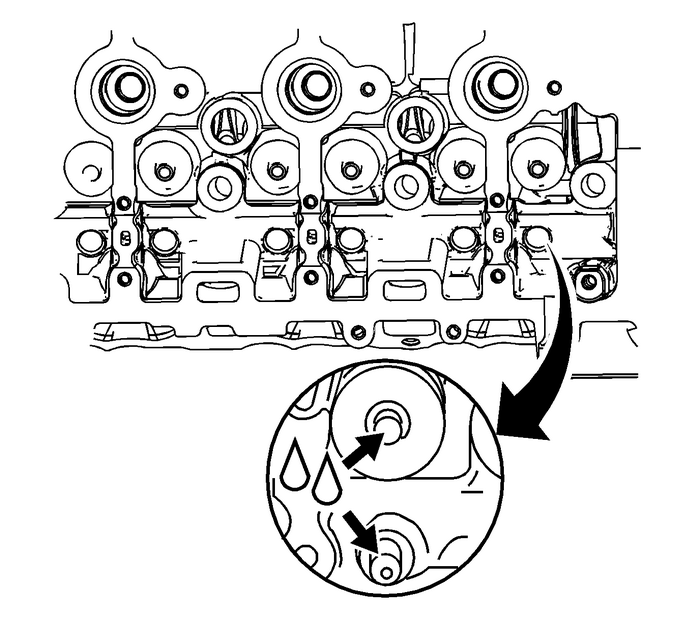 Ensure the intake camshaft notch is in the 10-o'clockposition-(2) and the exhaust camshaft notch is in the 7-o'clockposition-(1). The number-1 piston should be at top deadcenter (TDC), crankshaft key at 12-o'clock. Set the exhaust camshafton top of the roller followers in the camshaft bearing journals andlubricate. Refer toAdhesives, Fluids, Lubricants, and Sealers. 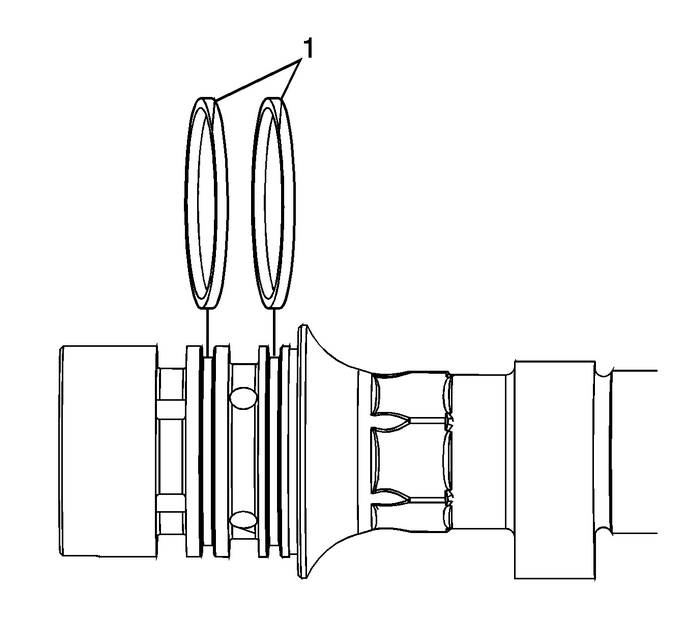 Rotate the oil sealin the groove of the number one camshaft journal so the split line-(1)is at approximately the 12:00 position before installing the camshaftcaps. Install the exhaustcamshaft with the notch on the front-(1) at approximately the7 o'clock position.Install the camshaft caps and hand start the camshaftcap bolts. 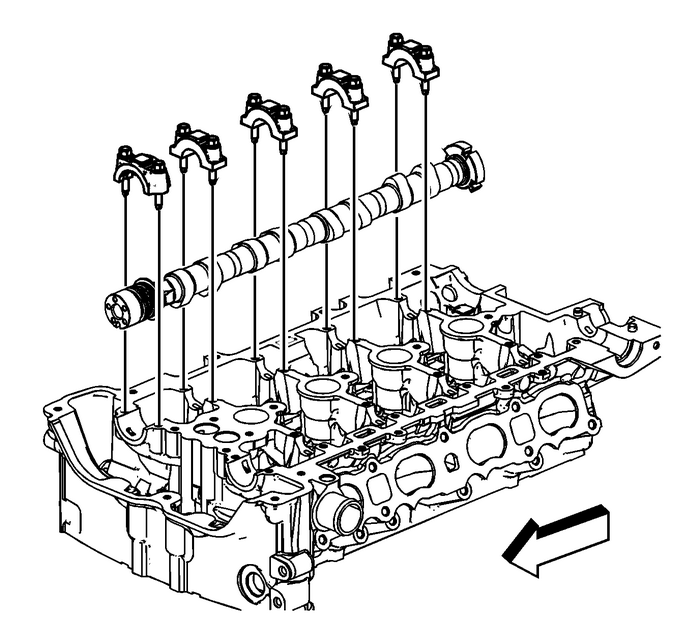 Tighten the camshaft cap bolts in increments of 3-turnsuntil they are seated. 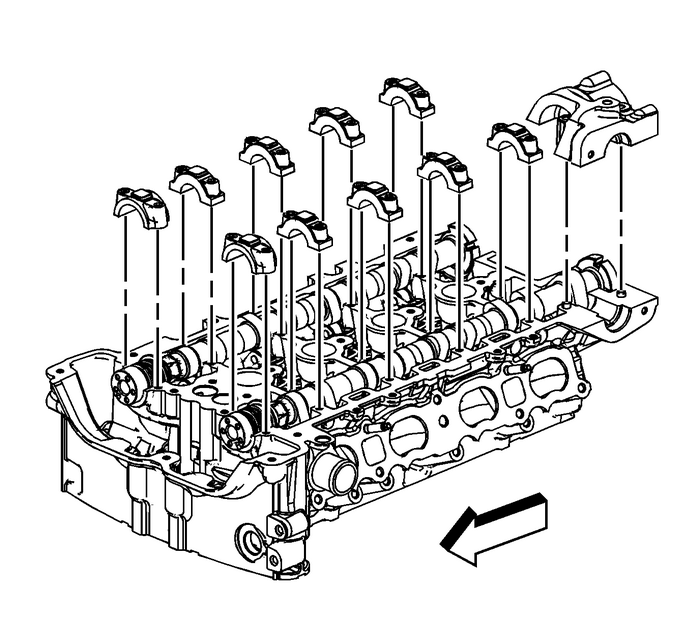 Tighten the camshaft caps to 10-Y -(89-lb-in). Install the exhaustcamshaft position actuator solenoid valve-(2). Tighten thesolenoid valve bolt-(1) to 10-Y(89-lb-in).Install the exhaust camshaft position actuator. RefertoCamshaft Position Exhaust Actuator Replacement.